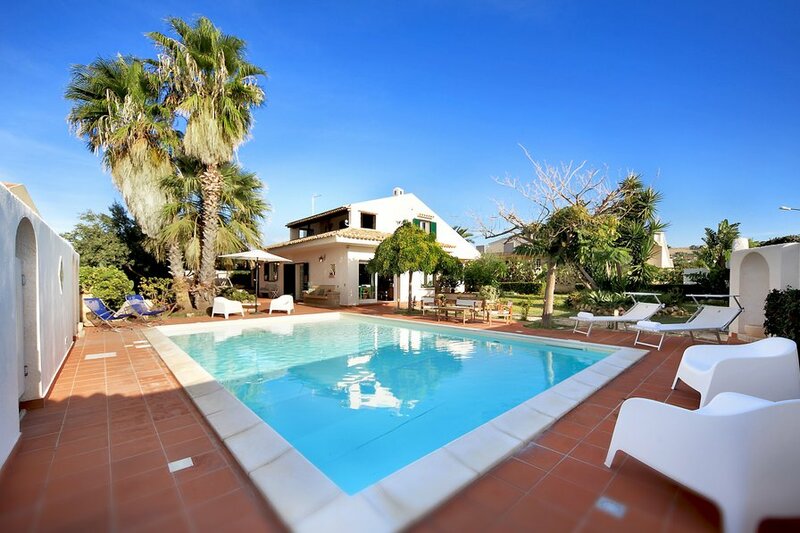 Delightful Villa far few meters from the beaches of Marina di Ragusa, surrounded by Mediterranean vegetation. Furnished in rustic spread over two levels. The entrance to the house is in the garden in front of the Villa, from this point you can already get an overview of the whole front of the house, the large covered parking, bordered by plants of prickly pears typical of Sicily, and all the variety of plants in the garden, by olive trees to palm trees, by banana trees to the Pomelie, all around the beautiful private swimming pool with Jacuzzi. After the charming garden to the entrance, just past the threshold you are already in the bright living room with a beautiful masonry fireplace, surrounded by armchairs and a small sofa. In the living room there is also a spacious dining table, while on the left the wall is covered by a wooden dresser that makes the room warm and cozy and a low cabinet with a LED TV. Past the living room to get to the kitchen in masonry, with wooden doors, equipped with all the necessary equipment for who love to juggle in kitchen, utensils, dishes, pots and pans are all at your disposal in the various compartments. The oven and the kitchen are practical and everything is lit by a glass door that opens onto the rear side of the veranda, where there is a barbecue and space for enjoying the cool summer on the deck chairs at your disposal or on the swing and to set up a large table. The laundry facilities include washing machine, toilettes and a shower. The sleeping area consists of a bathroom with shower, a double bedroom with a spacious closet, one bedroom with wardrobe and chest of drawers and a single with another wooden wardrobe. The attic instead, includes a large living room with double sofa bed, a spacious veranda overlooking the garden below, a double bedroom with another large mirrored wardrobe and a bathroom with shower and sanitary. The whole house is decorated to be comfortable in both summer and winter holidays, thanks to the beautiful fireplace that makes it warm environment, armchairs and sofa where you can relax in front of the TV with LED and a large table for those who like to dine with.